With an impeccable tradition for service and five-star comfort Hotel El Panama Convention Center and Casino is Panama*s premier destination for corporate and leisure travel. We offer an extensive array of features that distinguish this architecturally significant landmark as an unrivaled travel destination. The hotel features 350 elegantly decorated rooms and suites each offering commanding views of Panama City or the hotels beautiful gardens and pool. The hotels lushly landscaped outdoor pool-the largest-most beautiful hotel pool in Panama-offers a relaxing respite under swaying palm trees. Restaurante Miraflores: Located in the Miraflores Locks at the Panama Canal. Offers Lunch and Dinner Buffet. International Cuisine. Menu available. Molas Restaurant: Opens 0600-2200. Serves Breakfast/ Lunch/Dinner Buffet/ Brunch on Sundays. Specialized in International Cuisine. Menu available. Las Palmas BBQ: Is located in pool area. Specialized in the finest domestic and imported meats/ and a wide selection of grilled fish and seafood. As well as choices of healthy gourmet dishes. Bellamar I: Located in the first floor. Manuel Amador Guerrrero: New elegant business meeting room with gorgeous lamps hanging from the ceiling. 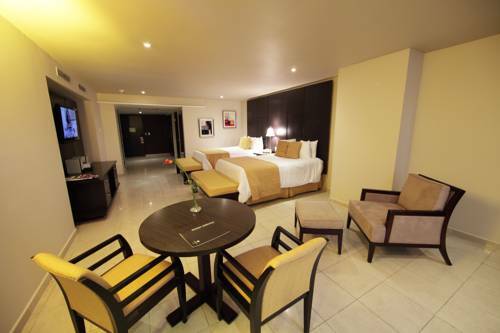 El Panama Hotel is centrally located in downtown Panama City/ 30 minutes away from Tocumen Intl. Airport/ 10 minutes from the Metropolitan National Park and the Panama Canal.